MiningWatch needs your help to ensure accountability for the Mount Polley tailings pond disaster. If you’ve been following the news about MiningWatch’s private prosecution against the BC government and the Mount Polley Mining Corporation (MPMC), then you know that the federal government is now trying to stay the charges. MiningWatch has teamed up with SumOfUs to launch a petition asking Prime Minister Trudeau, Justice Minister Jody Wilson-Raybould, and Fisheries Minister Dominic Leblanc to make sure the prosecution proceeds. At time of writing, MiningWatch needs fewer than 3000 signatures to reach their goal of 25,000 names, so please consider supporting them by signing the petition. 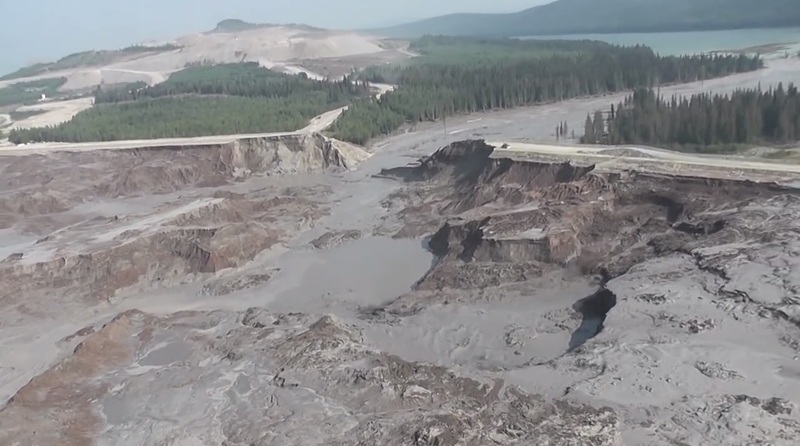 The 2014 Mount Polley tailings pond breach was the worst environmental failure in Canadian mining history. The breach unleashed almost 25 million cubic metres of arsenic-containing wastewater into the beautiful and bountiful Quesnel Lake in an apparent violation of the federal Fisheries Act. The federal and provincial governments both launched investigations, but they have dragged on for over two years without result despite evidence of harm to fish, fish habitat and communities. By October 2016, it became clear that the government was not going to determine whether to press charges against MPMC or the Province in anything resembling a timely manner. MiningWatch took the initiative and launched a private prosecution against the Province and MPMC under the Criminal Code. With support from our Environmental Dispute Resolution Fund, MiningWatch hired a lawyer and assembled the evidence it needed to support its allegations. The next step was a Process Hearing in the Provincial Court in Williams Lake, which took place on January 13th 2017. MiningWatch was ready to present its evidence about how MPMC and the Province failed to implement minimum safeguards, leading to the spill and to violations of the Fisheries Act. But in a deeply disappointing move, the Federal Prosecutor asked the court to stay the charges before MiningWatch even presented its evidence. Federal Prosecutor Alexander Clarkson apparently said that the MiningWatch prosecution is not in the public interest because the BC Conservation Officer Service, Environment Canada and Fisheries and Oceans Canada are already investigating the collapse of the tailings pond, and because there is no prospect of conviction. In my view, neither of those points is valid. This prosecution is in the public interest precisely because the investigations are still dragging on two and a half years after the Mount Polley breach. When a tailings pond bursts and our waters and fish are poisoned, it should not take the federal government two and a half years (and counting) to figure out whether or not to lay charges. In cases like Mount Polley, swift government action is essential to tell industry that breaking environmental laws will not be tolerated. As to whether there is a reasonable prospect of conviction, in this case that should be for the court to decide. Process hearings (also called “pre-enquetes”) are meant to weed out the good cases from the bad ones so that we don’t spend time and money bringing meritless cases to trial. At process hearings, private prosecutors must present evidence supporting every part of their allegations, and then the court decides whether there is enough to justify proceeding to a full trial. MiningWatch has evidence to back up the charges they have laid, and the federal government should be helping to assemble the evidence rather than standing in the way. So for the Federal Prosecutor to try to stay the charges before the evidence can be presented… one could say that such an action could be perceived as an attempt to prevent damaging evidence from coming to light, rather than an effort to protect the public interest. MiningWatch’s private prosecution is a powerful tool for accountability, and the evidence it gathered should be presented on the public record. If you agree, please sign the petition.